San Diego’s water department admitted to new problems with its billing practices, the Trump administration pushed out a border water official and more in our biweekly roundup of environment news. Within the next two years, federal officials may be forced to declare a water shortage on the Colorado River, an unprecedented situation that would reduce the amount of water available to parts of the southwestern United States and Mexico. The thermometer of the river’s health is Lake Mead, formed behind Hoover Dam. When the lake falls below a certain level, a shortage is declared and people begin to lose access to water based on an arcane priority system. The first to receive cuts are Arizona, Nevada and Mexico. If this all sounds familiar, it’s because the drought we’re experiencing began two decades ago. Officials at the U.S. Bureau of Reclamation worried aloud about a shortage in 2016 and 2018 but avoided one thanks to a combination of conservation techniques and decent snowfall. Come 2020, though, the shortage could be for real. What does this mean for San Diego? As John Fleck, the author of a recent book on western water once put it, “This is a big deal, but it is almost entirely an Arizona big deal.” That’s because, in theory, California’s rights to the Colorado are so secure that the Central Arizona Project — a 336-mile series of canals and pipelines that brings river water to 80 percent of Arizona’s population— would have to run dry before California has to lose a single drop. That doesn’t mean California is off the hook, though — not by a long shot, largely because letting Arizona go dry is a political impossibility. Most of San Diego’s water comes from the Colorado River, but officials at the San Diego County Water Authority seem confident about their water supplies. So confident that they have talked about forgoing some of their Colorado River water, possibly in exchange for money, to keep the water levels at Mead higher — though they have so far publicly declined to talk about any specific proposal. Haven’t states been preparing for this? Yes. I wrote two years ago about doomsday planning for the river, known in drier bureaucratic circles by the less riveting “Drought Contingency Plan.” Under that deal, California would agree to make unprecedented voluntary cuts to help Arizona avoid devastating cuts if problems continue. Frankly, I haven’t updated that reporting because the deal is still unsigned and not a whole lot has tangibly changed, though Lake Mead has kept getting lower and the drought goes ever on. At the time, both California water officials and Arizona officials were squabbling amongst themselves over issues within each state. Now, for the most part, California officials are largely on the same page and Arizona officials may be heading in that direction. 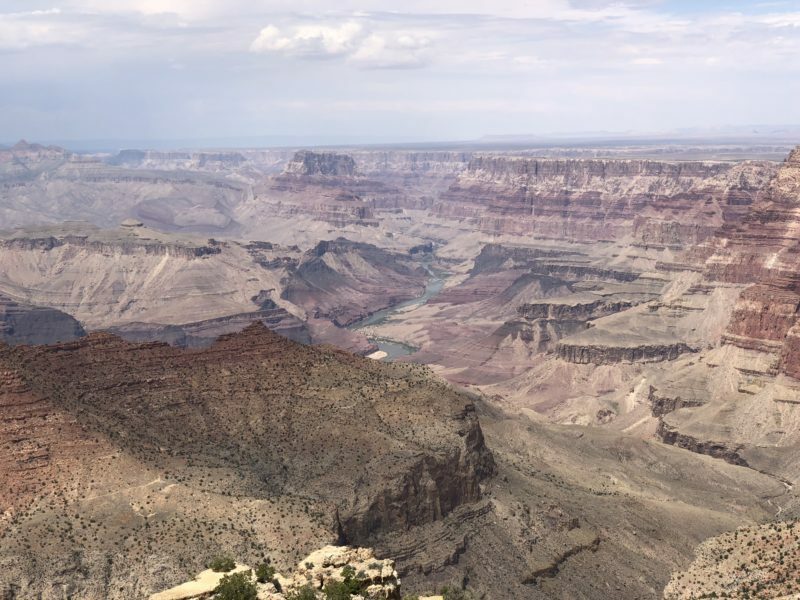 Officials from all the states in the Colorado River basin, not just the lower states in the Southwest, are meeting to talk about new ways to share the river. Yet, California and Arizona do share something in common — farming interests in Imperial County, California, and Pinal County, Arizona — that may end up complicating any deal. It’s easy to blame today’s problems — an overallocated river and declining reservoir levels — on drought and climate change, and both of these do play a role. But our predecessors knew 50 years ago this was inevitable. In 1968, as Congress debated authorization of the Central Arizona Project (CAP), it was clear there was not enough water to supply the 336-mile-long canal, which diverts Colorado River water. But the federal government, with Arizona’s enthusiastic support and the concurrence of the other six U.S. states in the Colorado River basin, charged ahead. Speaking of Arizona: Water officials there have dumped into the ground enough Colorado River water to meet the yearly demands of millions of people. But — here’s the kicker — they don’t yet have a clear plan to get it back out. Storing water in the ground is a fairly common practice. Orange County has been doing it for years. San Diego would do more of it, if only we had the sort of geology that would allow it. The total stored is nearly 3.6 million acre-feet of water in 28 sites across Pima, Pinal and Maricopa counties. That many acre feet of water could supply well over 20 million people with water for a year, though some of it is set aside for farming, not urban drinking water. They go into a few different problems Arizona officials have with their “water bank.” One of them is they have dumped all this water into the ground but haven’t installed the wells to pump it back out. Also, some of the groundwater could be contaminated with, among other things, arsenic. That, at very least, may increase the costs of treating the water before it can be used. A few California water officials have been wondering about Arizona’s groundwater storage program for at least the past two years because it affects California’s own water situation. Starting about two decades ago, California had to reduce its use of the river to make room for Arizona to increase its use — use that included dumping the water in the ground. It’s almost unsurprising at this point that the city of San Diego’s water department is admitting to new problems with its billing practices. After a recent audit of bill spikes found the department sent out 2,750 incorrect bills last year, the department last week said it may have messed up in a totally different way: It may be failing to bill up to 2,500 customers. The department revealed this after receiving questions from NBC 7 Responds. Between the bills that are too high and the bills that it didn’t send, how many customers have been affected by the water department’s recent troubles? Right now, it’s not quite possible to tell, because sometimes the department speaks of “customers” and sometimes it speaks of “bills” — a customer receives six bills a year, so six bad bills could affect just one customer. On the low end, the department says it sends out 1.3 million bills a year and only a tiny fraction of them are problems, a metric the auditors adopted to say the department was, by and large, doing a good job. However, another way of looking at this is to assume, on the high end, that the 2,750 incorrect bills and the 2,500 customers who haven’t received bills represent as many as 5,250 customers who have had billing issues in the past year and a half or so. That’s roughly 2 percent of the city’s water customers with billing troubles. A story by the Texas Observer and Quartz on the potential for cross-border cooperation on water policy has a few details about how the head of the U.S. Section of the International Boundary and Water Commission lost his job. The official, Edward Drusina, was widely respected in water supply circles, especially for a drought-sharing agreement he worked out with Mexico, but locally he and the commission are cursed because of ongoing sewage spills coming across the border from Tijuana. It took Drusina by surprise. He’d been helming discussions between Mexico and Texas about adopting a new model for Rio Grande flows, so that both sides would be using the same scientific data to gauge how much water Mexico would be able to deliver to the US, and when. The departure was badly timed — the two sides were finally nearing an agreement. The Trump administration has yet to appoint a permanent US commissioner to replace Drusina, leaving a vacuum in a delicate situation, just as the Rio Grande Valley, the southernmost tip of Texas which lies along the northern bank of the Rio Grande, plunges into another drought. San Diego Gas & Electric is taking the California Public Utilities Commission to court in an ongoing effort to raise rates to pay for damage the company helped cause during the 2007 wildfires. The company believes that it should be able to pass along some of those liabilities to its ratepayers, while utility regulators ruled that it could not because SDG&E’s failure to fireproof its equipment contributed to the damage. The Union-Tribune story includes speculation that SDG&E doesn’t have much of a leg to stand on in court. But what it doesn’t say is that the company’s attorney is one of the country’s top legal minds, Kathleen Sullivan, the former dean of Stanford University’s law school. Disclosure: Mitch Mitchell, vice president of state government affairs for San Diego Gas & Electric, is a member of Voice of San Diego’s board of directors.